Aren't they phenomenal? I love seeing each member's take on the skirt theme. 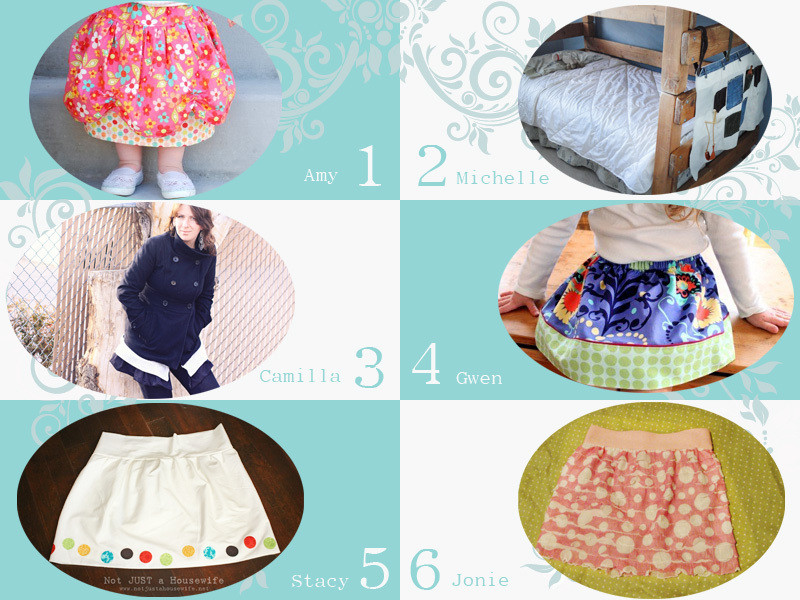 You can check out each of the tutorials by visiting each of the blogs listed above, and scroll down here to see the tutorial for my skirt. Isn't it pretty? I love that it adds a little extra interest and contrast to the skirt. 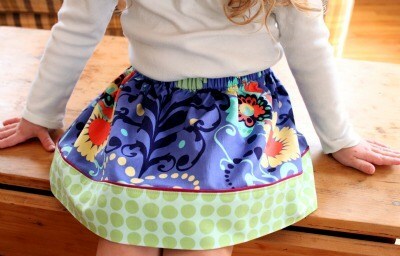 This is the skirt that both of my girls will be wearing on Easter this year. Start by determining the size of your skirt. You'll need to take two measurements. Measurement A: Measure from the waist to the knee, or whatever length you want your skirt to be. Measurement B: Measure your child around the waist. Make sure it's snug. Take your two main fabric pieces, place them right sides together, and sew down both short sides using a 1/2" seam allowance. 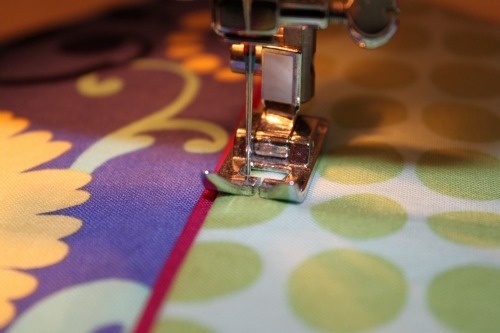 Serge or zigzag stitch in both seams to prevent fraying. 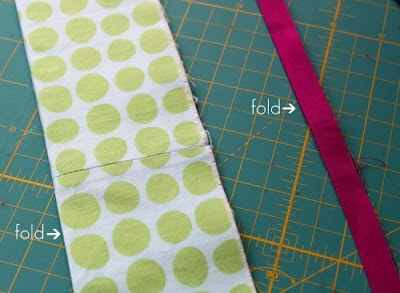 Take your two bottom band fabric pieces, place them right sides together, and sew down both short sides using a 1/2" seam allowance. Do not zigzag in the seam. 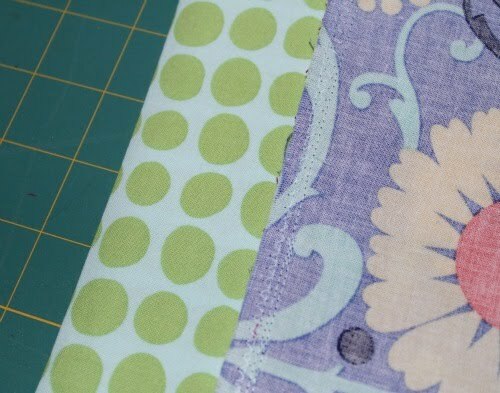 Take your two accent fabric pieces, place them right sides together, and sew down both short sides using a 1/2" seam allowance. Do not zigzag in the seam. 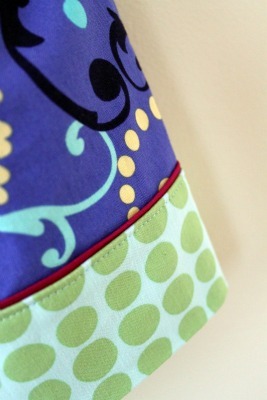 Press the seams open on both the bottom band and the accent fabric. 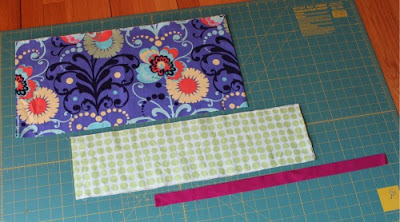 Fold the bottom band and the accent fabric tube in half with wrong sides together. Press all the way around. Now it's time to assemble the skirt. Turn your main fabric tube right side out. 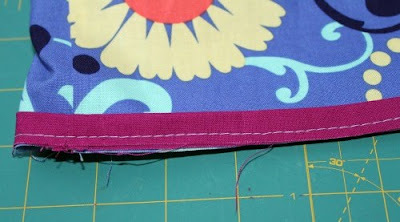 Slip your accent fabric tube around the bottom of the main fabric tube, lining up the raw edges. Also line up your side seams. Baste (using a very long running stitch) all the way around about 1/8" from the raw edges. Slip your bottom band fabric tube over the bottom of the main fabric/accent fabric tube, lining up the raw edges. 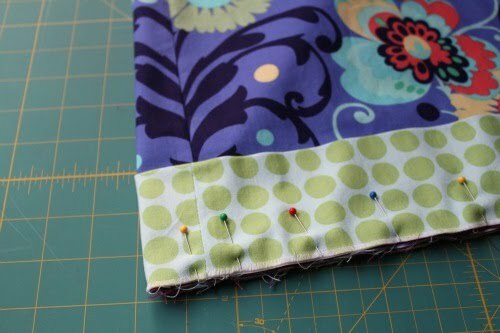 Also line up your side seams. 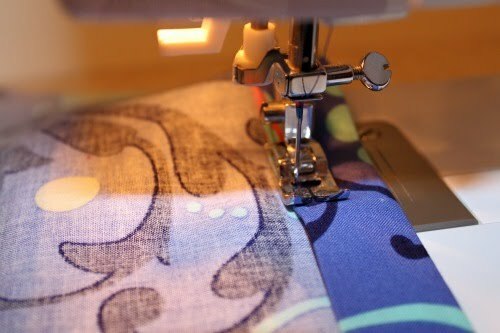 Make sure you reset your machine to a shorter stitch length. Sew all the way around about 1/4" from the raw edges (the bottom). Serge or zigzag stitch all the way around the edge to prevent fraying. 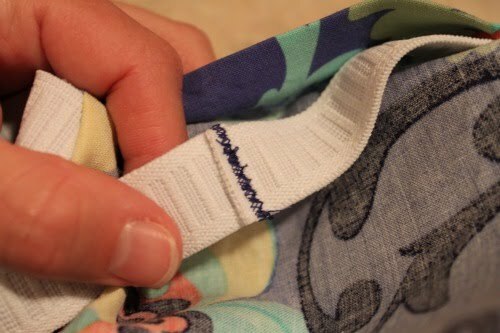 Flip your bottom band down, turn your skirt wrong side out, and press the seam toward the bottom of the skirt all the way around. Turn your skirt right side out. 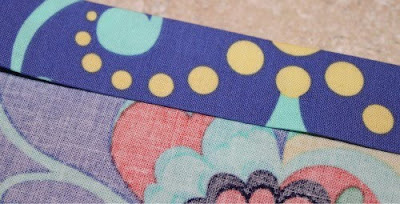 Topstitch all the way around your skirt about 1/8" down from the top of your bottom band. Now it's time for the waistband. Turn your skirt wrong side out. Fold over the top (waistband) of your main fabric 1". Press all the way around. Fold over again (another 1") and press again. 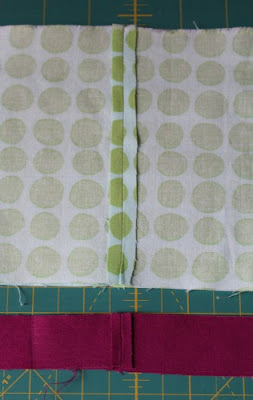 Sew all the way around about 1/8" from the bottom of the waistband, leaving a 3" opening. Cut your elastic to length (Measurement B). 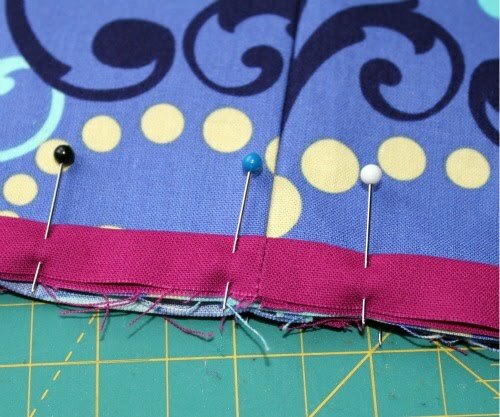 Using a safety pin, pin one end of the elastic to your skirt near your 3" opening. Grab another safety pin, and attach the pin to the opposite end of your elastic. Use this pin to feed the elastic through the waistband casing, making sure it doesn't get twisted. 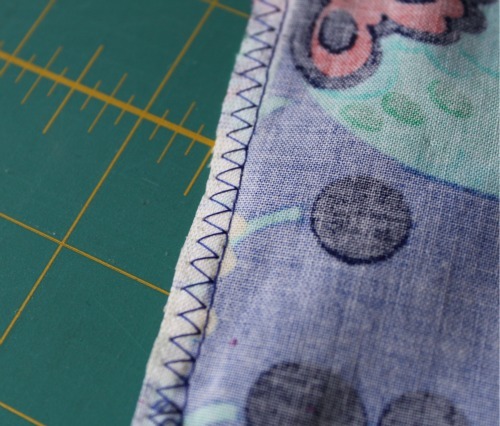 Once you get the elastic all the way through, overlap the two ends of the elastic and zigzag stitch back and forth over the overlap several times. Close up the opening in the waistband casing, being careful not to sew through the elastic. Now turn that skirt right side out, and you're done! OK, now you can run over to the Point of View skirt link party at Not JUST a Housewife:) I'll be featuring some of your skirts in a post next week. Hope to see you at the party! I love this skirt Gwen! I think the fabrics are awesome- Really digging the green dot fabric. And the little accent strip? Genius. Oh my gosh! I love these so much!! I love this skirt! My goodness..here's another one of your projects that I need to whip up! ;) Love it! Is that georgeous blue fabric Amy Butler? I love it..your skirt is fantastic! Your big girl looks like she loves modelling it too..does that make up for her baby sister's dress? What a sweet skirt! How did you know I was thinking of doing something similar???? they are adorable Gwen-it looks just like piping! I love the colors! And you are right, the piping adds just the right amount of interest. very pretty little skirt and I agree that little bit of piping really makes it special! lovely work as usual! SUCH a beautiful skirt! You have some made sewing skills, the piping is great! I love it! It's so pretty!! This is beautiful! I sew with a glue gun and Stitch Witch, so I tip my proverbial hat to you. Lovely Easter Skirt - the piping does add interest, and of course absolutely one of my favourite fabric collections!! 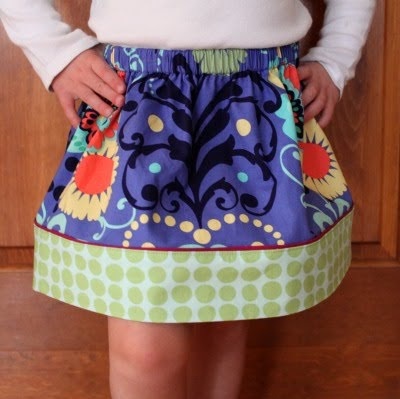 This skirt is so adorable and what a great tutorial. Oh my gosh this is so darling! 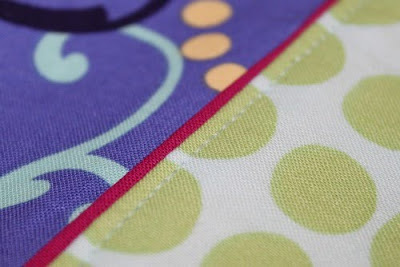 I love the contrasting piping and LOVE your fabric choices! Your daughters will be styling! So super cute! You have such talent, your stitches are perfect. I am visiting you back from barbwired. I love fabric you used for this project! So cute! and it turned out so darling. I wish I could download all your vast sewing knowledge into my head! you are so talented! These are all adorable. What a great idea to collaborate on a project like this. I'm excited to see it every time. 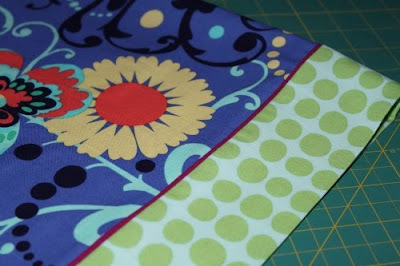 I am featuring this today at somedaycrafts.blogspot.com. Grab my "featured" button.